After acing the written test and coming in #2 in the first round of Cummins Top Tech competition, we set off for Montreal last week so Devin could compete with the other 2 technicians that made it into the next round. We arrived just in time for the Pointe Claire branch reps to take us out for dinner with the other competitors. It was a nice opportunity to get to know the other guys as well as the people that put together the contest. Devin stayed modest and commented that it would be tough competition, but from the first time I had heard about the competition, I felt he was going to win. The next morning he was picked up at the hotel at 8am. I had no idea how long the competition would be and since we had taken Devin's work truck - I was stuck at the Holiday Inn. There wasn't really much that I could walk to without crossing a 4 lane highway, so I indulged in a day of relaxing by the pool, reading and watching HGTV. I kept looking at the clock and wondering when he would finish and when I would finally know the results. Although I knew he would win, I had to mentally prepare what I would say if he didn't. I had not really considered that before! It was nearly 6pm when I heard the card in the hotel room door. He walked in and casually asked me how my day was. I quickly responded by asking how HIS day was. He said it was alright and then dropped the bomb. "Well, you're married to Canada's Top Tech!" What!?!?! How exciting. I was so proud of him. He just proved himself to be the top Cummins Tech in all of Canada! And, as a bonus, won $5,000 US. He will now move on to the next round of competition in May. We are both invited to go (expenses paid) to Indiana where Devin will compete against America's Top Tech and Mexico's Top Tech. The competition will be fierce, but the winner will go home with $10,000 US in his pocket! We went out to celebrate in Montreal that night. A Google search provided a fantastic restaurant called Gibby's. It is in an old stable from the 1600's so the atmosphere is quite unique. The food was exquisite and the service was impeccable. 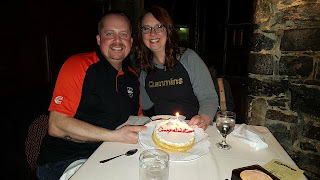 Our waitress Mona took excellent care of us and when we told her that we were celebrating Devin's win, she brought out a cake and took our photo. At the end of the meal, she brought the bill and a small card which had the photo tucked in it as a souvenir. So sweet! We spent the next two days exploring Montreal: wandering small markets, checking out the biodome, meandering old Montreal and sampling exceptional food along the way. It was such a wonderful and welcome getaway for the two of us.